Etter Tree Care was established in San Antonio by Edward Etter in January 1976 as Tree Maintenance Services. Mr. Etter began the tree care business in response to the growing demand for professional tree care in and around the San Antonio metroplex. 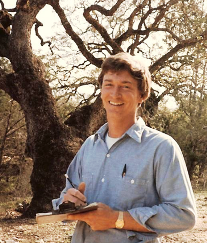 In June of 1976, Ed was hired as a city arborist, overseeing municipalities such as the San Antonio River, public golf courses, and parks. After three months of working for the city, he decided to return to his private tree care business. From August of 1976 through 1995, Ed focused on developing his services and expanding his customer base. In June 1995, David Vaughan joined the tree care team bringing with him twenty years of experience. After 4 1/2 decades in the tree care industry, David retired at the end of 2018. Operations were further expanded to three crews and in addition, services expanded to include an oak wilt management program. J.R. Jackson joined the Etter Tree Care team as production manager in February 2002, contributing over twenty-five years of experience. In May of 2006, Ed’s daughter, Elysia Etter was hired as Assistant Arborist Representative. Today, Etter Tree Care is still dedicated to providing South Texas with a locally owned and operated family business that values honesty, integrity, ethics and excellent customer service for those in need of professional tree care services.